But just who was the “Mr. Alexander” that Dewey apparently held in such high esteem? And what did he do to merit Dewey’s praise? “Mr. Alexander” was F. Matthias Alexander (1869-1855), an Australian by birth, who lived most of his life in London. He was the developer of a method of teaching people how to change harmful habits of posture and movement – habits that prevented them for operating at their full potential. His method continues to be taught today and is commonly called the Alexander Technique. It might seem strange that a philosopher would be so taken by a process that seems mainly to do with the operation of the physical body. After all we don’t usually attach great philosophical importance to the activities of our chiropractor, massage therapist or physical trainer. 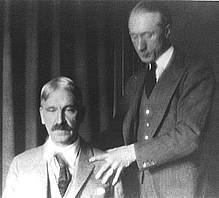 When Dewey and Alexander first met in New York during World War I and had a series of lessons with Alexander, the most immediate results were dramatic improvements in his breathing, eyesight and in the flexibility of his ribcage. Before then, Dewey had always been a very cerebral person and considered his body to be just something needed to keep his mind functioning. “The greatest benefit he got from lessons, Dewey said, was the ability to stop and think before acting. Physically, he noted an improvement first in his vision and then in breathing. Before he had lessons, his ribs had been very rigid. Now they had a marked elasticity which doctors still commented on, though he was close to eighty-eight. In my own work as an Alexander Technique teacher, I find that physical and mental rigidity often go hand in hand. You can verify this for yourself by taking a close look at people you know and comparing the ease of their physical bearing with their openness to new ideas. There are exceptions of course – often very dramatic ones, too. But this kind of observation provides evidence of the mind-body unity Dewey spoke about, and which was emphasized by Alexander. Today, Alexander Technique teachers continue to stress the connections between the way we think about how we sit, stand and move, and the manner in which we actually perform these activities. When we learn how to be precise in our thinking about what we want to happen, the physical results follow automatically. As with John Dewey, the immediate benefits are often primarily physical in nature. Indeed many people initially take Alexander lessons because of back pain, stiff necks and shoulders and the like. But over time they sometimes discover other, more subtle, benefits of the sort Dewey found. And for some, these unexpected benefits turn out to be the most valuable.